SpeakEasy Presents Boston Premiere Of "Clybourne Park"
Of Tony Award-Winning "Clybourne Park"
From March 1 - 30, SpeakEasy Stage will present the Boston-area premiere of "Clybourne Park," winner of the 2011 Pulitzer Prize for Drama, the 2011 Olivier Award for Best New Play, and the 2012 Tony Award for Best Play. Performances will take place in the Roberts Studio Theatre in the Stanford Calderwood Pavilion at the Boston Center for the Arts, 527 Tremont Street in Boston’s South End. 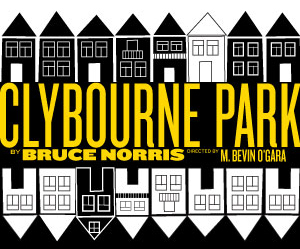 Written by Bruce Norris, author of "The Pain and the Itch," "The Unmentionables" and "A Parallelogram," "Clybourne Park" is a bold work about race, real estate and the volatile values of each. Inspired by Lorraine Hansberry’s classic play "A Raisin in the Sun," this acclaimed work explodes in two acts set 50 years apart. Act One takes place in 1959 as nervous community leaders anxiously try to stop the sale of a home in a white community to a black family. Act Two is set in the same house in 2009, as the now predominantly African American neighborhood battles to hold its ground in the face of gentrification. The SpeakEasy cast features Thomas Derrah, Michael Kaye, Marvelyn MacFarlane, Philana Mia, DeLance Minifee, Paula Plum, and Tim Spears. M. Bevin O’Gara, whose recent local credits include "You for Me for You," "Love Person," "Matt & Ben" and "The Pain and the Itch," will make her SpeakEasy directorial debut with the production. "Clybourne Park" premiered Off-Broadway at Playwrights Horizons on February 21, 2010, where it ran for one month. The play had its UK premiere in August 2010 at the Royal Court Theatre in London directed by Dominic Cooke. It later transferred to Wyndham's Theatre in the West End, winning the 2011 Olivier Award for Best New Play. Following productions in Providence and Philadelphia, "Clybourne Park" opened on Broadway at the Walter Kerr Theatre in April of 2012 for a 16-week limited engagement, which was later extended. The Off-Broadway cast reprised their roles. For tickets, call 617-933-8600 or visit www.SpeakEasyStage.com.